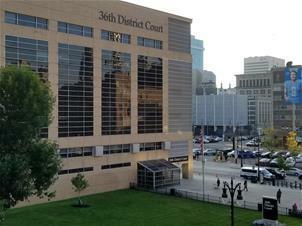 The 36th district court in Detroit. The lawsuit contends that bond hearings before 36th district judges are cursory. Most take place via video conference and last less than five minutes. Defendants don’t normally have a chance to make their case for pre-trial release, nor does the court make any inquiry into their ability to pay bail. And the vast majority of defendants don’t have lawyers at arraignment. As a result, the lawsuit argues, around 85% of defendants are required to pay cash bail. That leaves many defendants sitting in jail without having been convicted of a crime. Estimates suggest around 60% of the Wayne County jail’s population at any given time is pre-trial defendants. Dan Korobkin, deputy legal director with the ACLU of Michigan, says the cash bail system allows people with money to walk out of jail, while the poor stay behind bars, regardless of whether they are a true flight risk or pose a danger to the community. “Originally, bail was supposed to make sure that people returned to court to face whatever charges are pending against them. But instead, the money bail system has morphed into mass incarceration for the poor,” Korobkin said. Korobkin says there should be a presumption of pre-trial release in almost all cases. “Except in truly extraordinary circumstances, people accused of crimes who are presumed innocent should be going home to their families, not sitting in jail because they’re too poor to pay bail,” he said. Korobkin argues there are better, fairer ways to make sure defendants show up to court. He points to Washington, DC, which has done away with cash bail and releases 90% of pre-trial defendants. Of those, 90% show up for their court dates. Simple measures like text message reminders and transportation assistance have proven at least equally effective at getting people back to court, says Amanda Alexander of the Detroit Justice Center. That group, working with the Detroit chapter of the national Bail Project, works to free people incarcerated because they can’t make bail. “It’s essentially this devastating system where if you are poor, and your family cannot afford that few hundred dollars to bail you out, you are stuck with some pretty awful consequences,” Alexander said. Alexander says an inability to pay bail can cause people to lose their jobs, housing, and in some cases custody of their children. Pre-trial detention can also force people to consider taking guilty pleas even if they are not guilty, just to get out of jail. “The 36th district court is all about just churning people through, processing them through quickly. And oftentimes it is a minute or so, that this determination that can make someone’s life fall apart is made,” Alexander said. The lawsuit is filed on behalf of seven initial plaintiffs, all locked up in the Wayne County Jail because they can’t afford their bail. Another plaintiff, Timothy Lucas, was arrested April 9th for misdemeanor assault and battery. Lucas, 65, lives in a rooming house and says he can’t afford $300 for bail. He reports having a variety of medical conditions, including seizures and asthma, and lives on disability payments. The lawsuit names 36th district court Judge Nancy Blount, the court’s six magistrates, and Wayne County Sheriff Benny Napoleon (as jail administrator) as defendants in the lawsuit. The court could not be reached for comment on the lawsuit Sunday.